LA’s Ships Have Sailed have a knack for creating uplifting music, and their latest effort “Up” is no exception. Today, we have the pleasure of premiering the band’s ‘Lo-Mix’ – a mellow & exposed version of the original track that really brings forth the power of the song’s lyrics. Vocalist Will Carpenter utters, “Stand up…stand up…stand up” as the keys take you into a state of bliss. 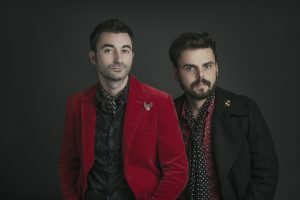 Ships Have Sailed will release their remix EP Mixed Up tomorrow (June 23rd), which features a variety of re-imagined versions of the single “Up.” Fans can purchase the EP right HERE. Be sure to keep up with all things Ships Have Sailed on Facebook, Twitter, and Instagram.